Please join us in congratulating Heiby Oil Company, Inc. as November's Logan County Chamber Business & Entrepreneur of the Month. Heiby Oil began serving Logan County customers 65 years ago on January 1, 1951 when Don and Mary Heiby opened a station at 1244 S. Main Street, where Kings Country Corner is now located. At that time, fuel oil was nine cents and gasoline sold for fifteen cents per gallon and was delivered by rail cars from a Lima refinery. In the late 1950's, Heiby expanded their business and built the Tip Top Truck Plaza and what is now the Homecoming Restaurant at the north end of Bellefontaine to serve customers near the new State Route 33. Their current location, 1020 S. Detroit Street, was purchased in the early 1960's where they shared the rail line with the Ohio Farm Bureau. Heiby Oil Company was then purchased by Logan County residents, Mr. and Mrs. Donald James, on November 15, 1975. The company prospered with their leadership and expanded to include stations in Bellefontaine, Urbana, and Mount Victory. In the 1980's, Heiby Oil saw tremendous growth in their customer base as Honda of America and their many affiliates boosted Logan County's economy. Fuel oil at this time was fifty cents and gasoline sold for eighty cents on the gallon. In August of 1992, they made a strategic move and entered into the propane market. With this expansion, they began servicing five counties and over 1,000 customers. On December 31, 2006, the reins were passed from father to son when the Jameses sold the business to their oldest son, David, the current President. 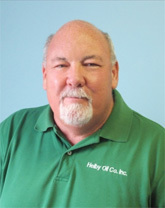 Other members of Heiby Oil include Neil Davis, Vice President and third generation family member, Carol Ransbottom, and Brandy Hunter. Heiby Oil continues to thrive and grow and is currently serving over 2,400 customers. 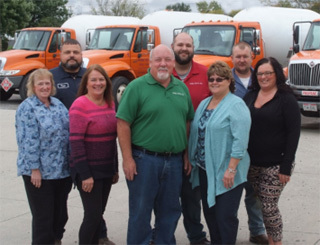 Heiby Oil have been Chamber members for 28 years and believe that "the work the Chamber does is good for all small businesses in the county." Their marketing strategy focuses on treating their customers with respect and appreciation. If you have a concern, they want to hear about it and will do what they can to address it. Logan County isn't just a community of customers to them, it is their home. "If you're looking for a locally-owned, family-run business where common sense and respect are the norm - look no further. Stop in today and we'll treat you like you deserve!" We thank Heiby Oil for their 65 years of service and commitment to Logan County and for their 28 years of Chamber membership!